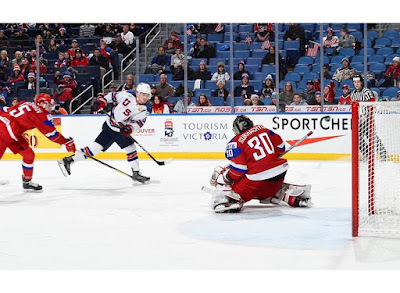 Former Terrier Kieffer Bellows scored twice—including the third-period game-winner as Team USA defeated Russia, 4-2, in the quarterfinals of the IIHF World Junior Championships in Buffalo. The U.S. will meet Sweden in the semifinals on Thursday (4 p.m. ET), while Canada (with Terrier blueliner Dante Fabbro), an 8-2 winner against Switzerland, is in the other semifinal, meeting the Czech Republic, which upset Finland (with BU’s Kasper Kotkansalo), 4-3, in a shootout. Bellows gave the U.S. an early lead on a power play, one-timing a Brady Tkachuk touch pass home from the right faceoff dot. 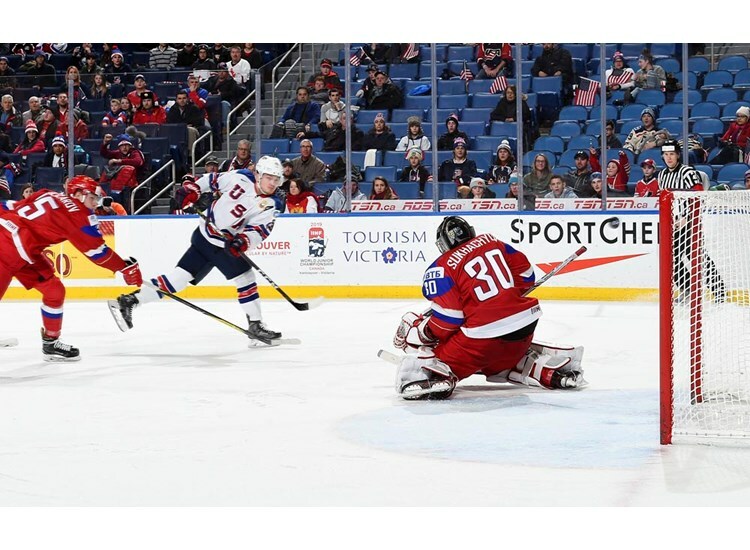 Team USA held a 2-1 lead going into the final period, but Russia knotted the score at 2-2 early in the period. At 12:31, Bellows beat a Russian defender to a rebound off the end boards and rifled the puck past Vladislav Sukhachyov, launching the water bottle into the air. Team captain Joey Anderson would add an empty-netter for the 4-2 final. Tkachuk led all U.S. skaters with 25:24 in ice time. ►Terriers return to the ice on Friday with an exhibition against the NTDP U18s with four 2018 BU recruits: forwards Joel Farabee, Tyler Weiss, Jake Wise and Jack DeBoer. Puck drop at Agganis is at 7:30 p.m. BU gets back to Hockey East action the next night, hosting Maine. Alex Chiasson scored his seventh goal in the Capitals’ 5-4 overtime win against Carolina. Charlie Coyle scored his third goal as Minnesota thumped Florida, 5-1. Senior captain Rebecca Leslie has been named captain of Team Canada at the upcoming Nations Cup tournament. Victoria Bach will wear an “A” during the event in Fussen, Germany, beginning today.